These watermelon bites are dairy-free, gluten-free, vegan, and paleo, making them the perfect snack to serve a crowd this summer. This recipe is a tad sweet and a tad savory, so it will pair well with a variety of foods at your next picnic, potluck, or BBQ. You can also adapt the cashew cheese to your personal taste by making it sweeter (add a touch of maple syrup), a little spicy with a hint of cayenne pepper, or add other herbs for a different flavor. Soak cashews in a few cups of water for about 20 minutes, until softened, then drain water and reserve cashews. Add cashews to a food processor along with olive oil, apple cider vinegar, black pepper, and salt. Process until smooth, scraping down the sides as necessary. If a smoother/creamier consistency is desired, add more olive oil as needed. Once smooth, add to a glass container and mix in chives. Store in the refrigerator and allow to firm up before using. Cut open the watermelon and cut the flesh into 1-inch chunks. 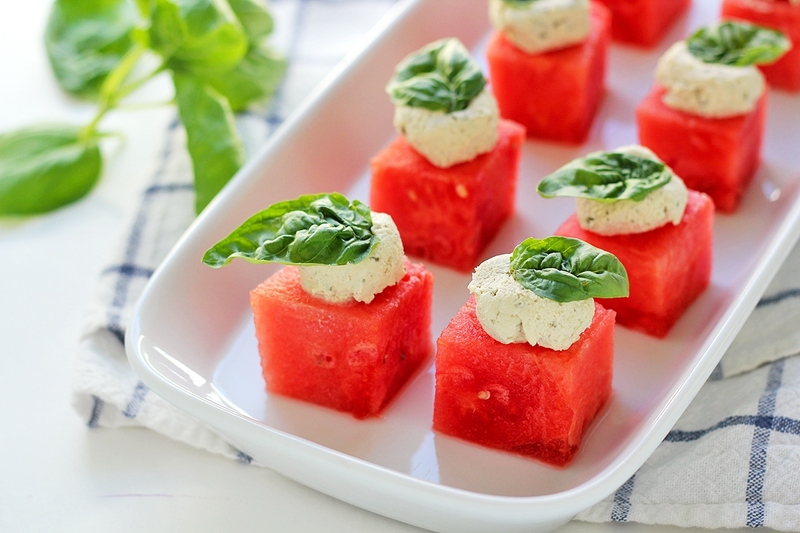 Spoon a small amount of the cashew cheese on the watermelon cube and top with a basil leaf. Store in the refrigerator until serving.